Two beautiful videos tonight. They should make you well up with emotion because they are that poignant. 1) Welcome Home Solider: A young man serving his country in Kuwait surprises his father-in-law with a surprise visit. The bulky, grown man is overcome with emotion. 2) Kids With Cancer: The children at Seattle Children’s Hospital make an inspirational video against cancer. It’s set to Kelly Clarkson’s anthem “Stronger.” Whatever you think is going wrong in your life, keep it in perspective. These kids, battling one of the hardest things a person can battle, are staying strong through love and courage. That’s an inspiration to us all. 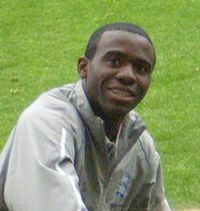 A FA Cup quarter-final match between the Bolton Wanderers and Tottenham Hotspur was abandoned after midfielder Fabrice Muamba collapsed during the 41st minute of the match. The soccer player remained in critical condition on Sunday morning. Doctors and paramedics performed sustained resuscitation efforts on Muamba for well over five minutes on the field before removing him. Muamba was “not breathing” as he left the field and was taken to London’s Chest Hospital. Doctors were able to eventually get his heart working again. The Guardian reports Muamba’s heart was not working independently for two hours after the cardiac event. The crowd of 36,000 held their heads in silence as Muamba was removed.